The vignette is a welcome sign of spring to come. 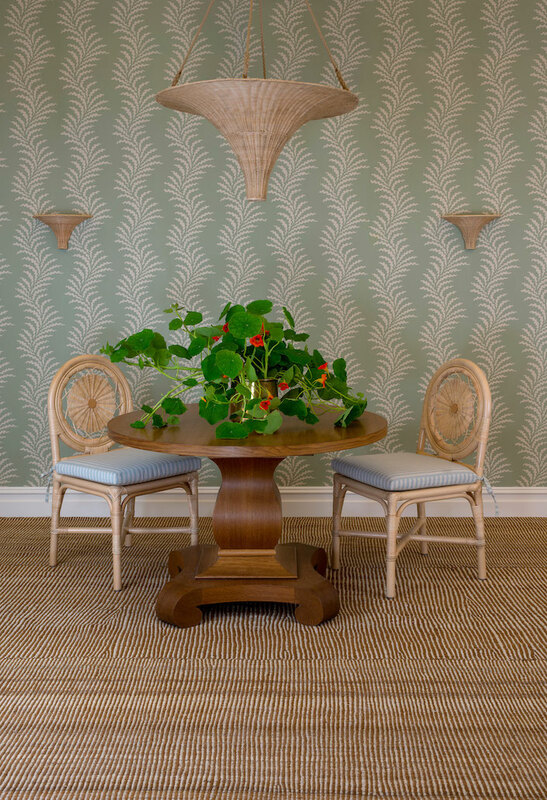 Against the lovely large scale Scrolling Fern Frond wallpaper in the new cream on duck egg blue colorway, the new Rattan Nasturtium Hanging Light echoes its wall light sibling, below, and the Rattan Carousel Chair (the pared back version of The Carousel Chair), all handmade in their Leicestershire workshop. A new version of the scallop edged Rattan Venus chair is now on a forged metal base, shown against the pretty new Flame Flower in its sheer iteration. 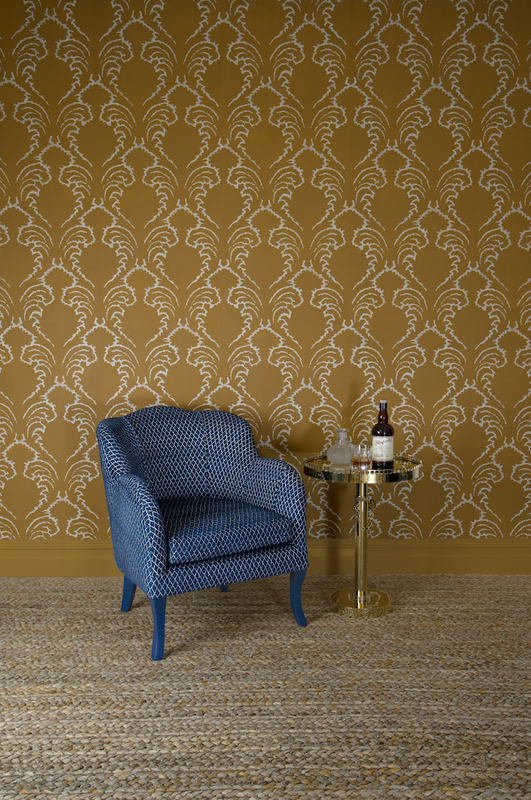 Inspired by a 1930s gold printed sample, this botanical print has a stencil-like graphic quality. 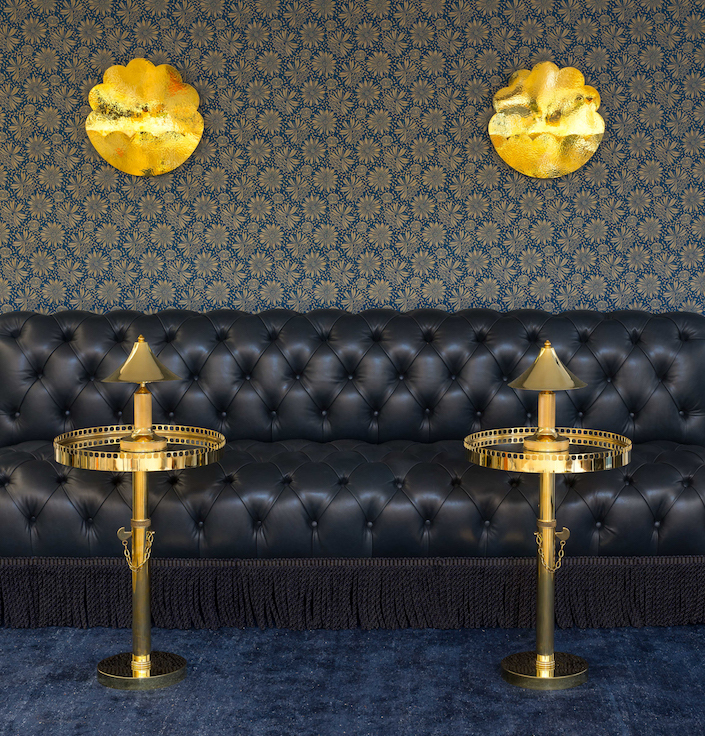 Below, in gold on indigo linen, the same pattern is completely transformed within a stylish club like environment featuring a pair of the oh-so-chic Carafe Tables, shown here in polished brass but available in any of Soane’s metal finishes. With the stylish form meets function brass peg and chain, this elegant drinks table is height adjustable. Also shown, above and below, the charming Knurled Column Lamp – perfect for intimate dining with a battery powered tea light – The Pagoda Shade is offered separately. 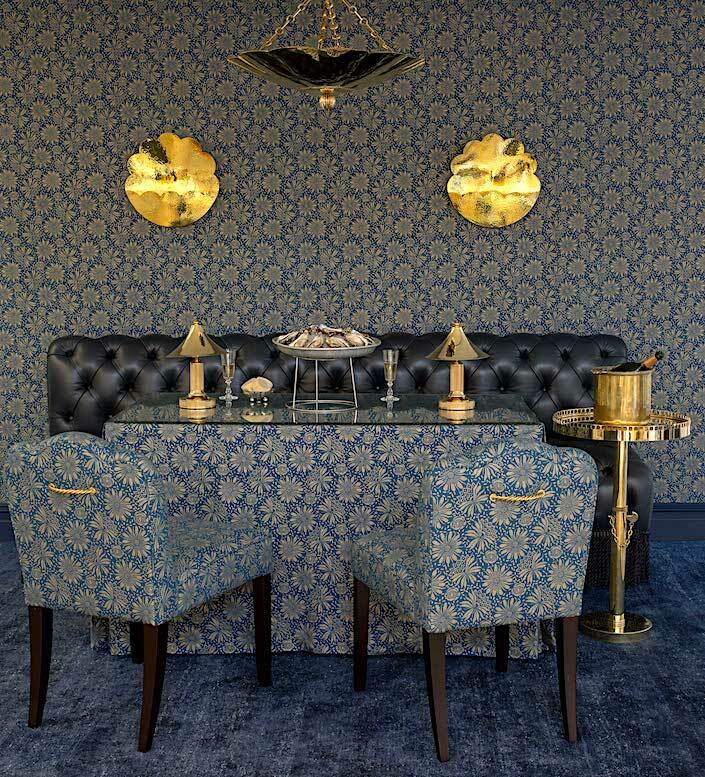 Flame Flower is also shown above on the new Simplified Scallop Chair – a fully upholstered dining chair (also available as a bar stool) – whose shape is echoed in the glamorous new Scallop Hanging Light (Large), entirely handmade from sheet brass by specialist silversmiths. 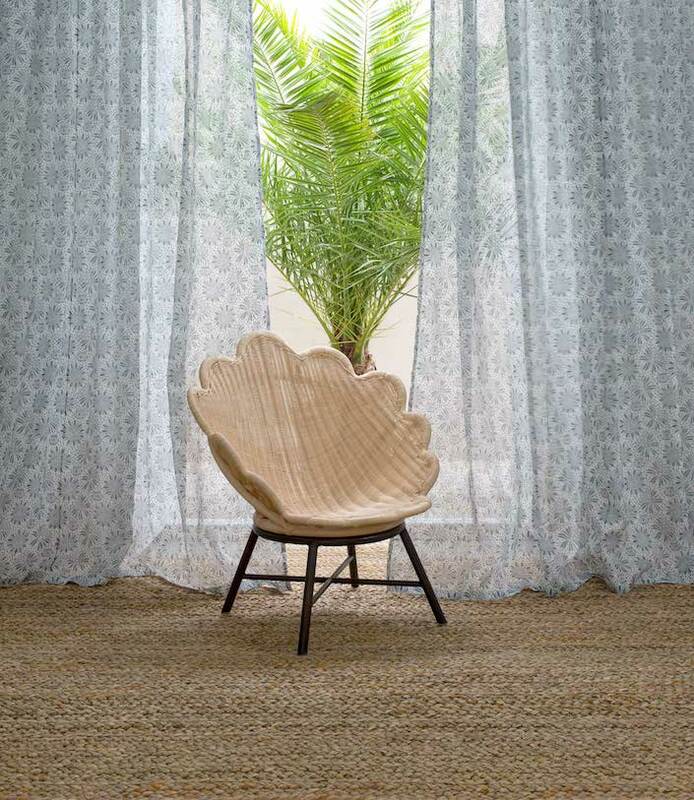 In the same seating collection is the new Simplified Scallop Armchair, with its sinuous curves and stylish sabre legs. Shown in the new Giraffe Diamond, a truly reversible cotton chenille, I love how its legs are painted in indigo for a unified look (also available of course unpainted). 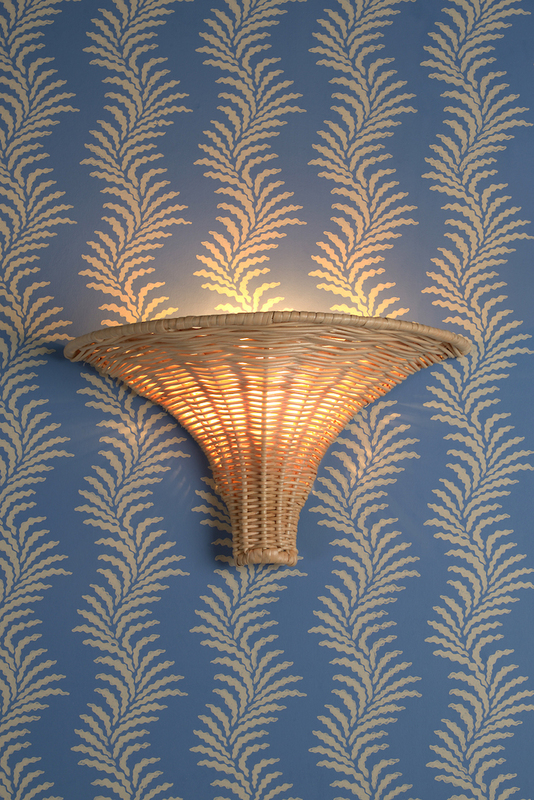 In the background is Pineapple Frond Wallpaper in its new cream on tobacco colorway. 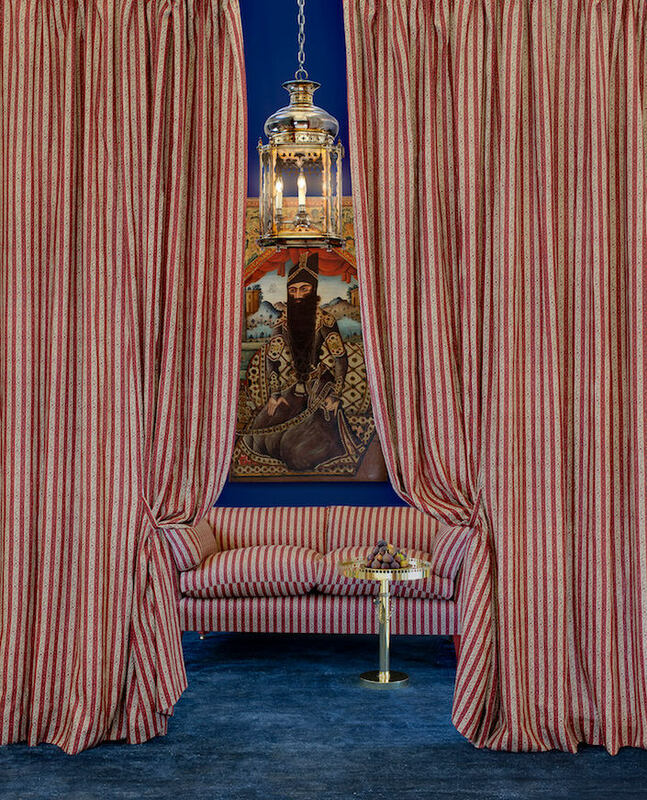 Soane co-founder and Creative Director Luly Lytle has a penchant for textile history, particularly the intersection of east meets west and the new Qajar Stripe represents just that. 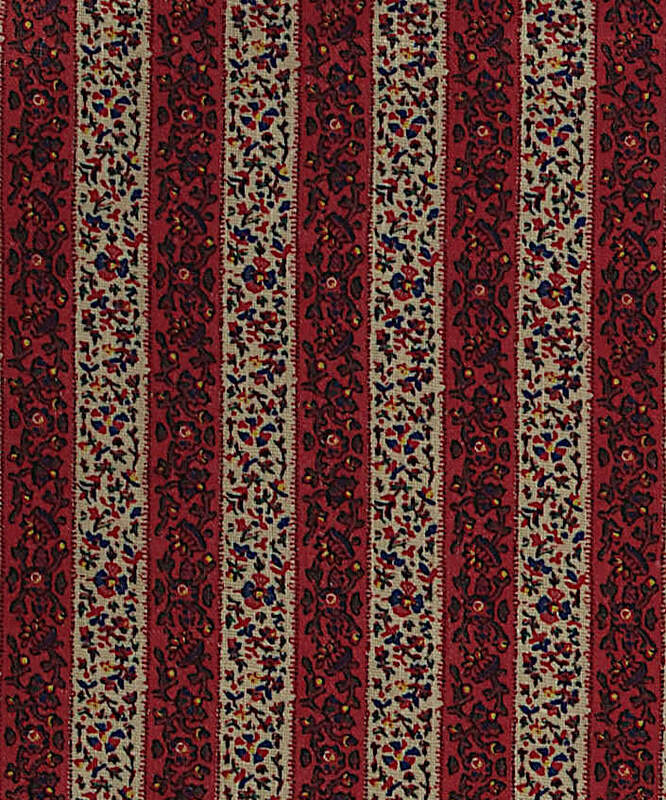 Based on an antique mid 19th century textile made in Lancashire for the Easter European market, it is “reminiscent of the stripe seen in billowing sleeves of costumes from the Qajar Dynasty.” Shown above with the new Carafe Table and long time favorite, the Ottoman-inspired Topkapi Lantern, the pattern is filled with a profusion of flowers within its stripes, below. 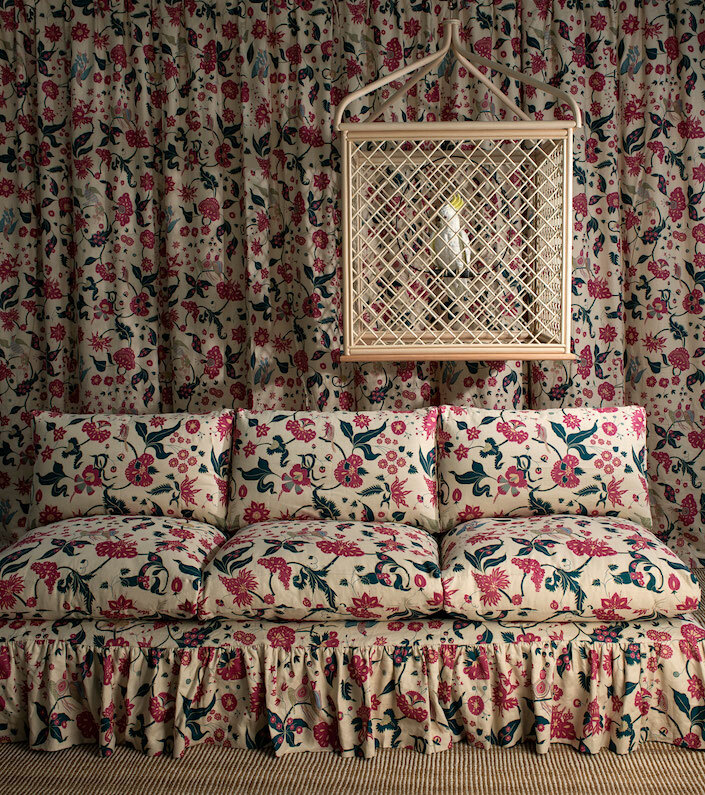 Similarly, the exuberant new Indian Parrots is inspired by antique embroidered panels form Ashburnham Place. With flowers, parrots and squirrels delineated in 6 colors on linen, this joyful depiction of nature is true to its 18th century original in both design and colors. And while whimsically shown with parrot in residence, that stately fixture is the Rattan Bird Cage Lantern. This entry posted in design, furniture, interior design, lighting. Entry Tags: Designer fabrics, Fabrics, Furniture, handmade, interior design, Soane, Soane Britain Bookmark the permalink. So nice to see eclectic fabric and design back , And of course good design never dates . I love color (especially blue) and I love patterns! Great to see color and patterns again! Honestly Ilove them all….They are all beautiful !!! i would like to live in one of your photos. Wonderful colors and design. I am so tired of seeing designers doing all whites and greys only. If not, they are doing this Farm House Trend …. It is time for beauty, color, fabric, etc. 80 queries in 0.588 seconds.